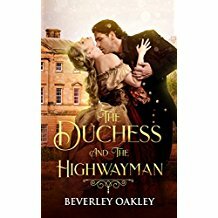 A duchess disguised as a lady’s maid; a gentleman parading as a highwayman. She’s on the run from a murderer, he’s in pursuit of one. Married off at a young age to a brutal nobleman, Phoebe, Lady Cavanaugh, longs for love—and enters into a risky affair. Framed for her husband’s murder, she flees wearing only a blood-stained chemise and is rescued by a handsome ‘highwayman’ who believes she’s Lady Cavanaugh’s maidservant. Hugh Redding has his own reasons for hunting the man whose mission is to see the infamous and elusive Murdering Duchess hanged for murder. And Phoebe, the 'maidservant with aspirations above her station’ might prove the very weapon he needs—once he teaches her how to behave like a lady. Only when Phoebe mysteriously disappears does Hugh realize the real identity of the spirited wench he’d set out to tame—and the danger she's in.